VLADIVOSTOK, Russia, Sept. 12-- Chinese President Xi Jinping and Japanese Prime Minister Shinzo Abe met here Wednesday on further improving bilateral ties and shouldering joint responsibility in promoting global and regional peace and stability, as well as development and prosperity. The two leaders met on the sidelines of the fourth Eastern Economic Forum held in Russia's Far Eastern port city of Vladivostok. Xi expressed his sympathy for the heavy casualties and property losses in Japan's Kansai area and Hokkaido, which were hit not long ago by a powerful typhoon and an earthquake respectively. The international situation is undergoing profound and complicated changes with increasing instability and uncertainties, Xi said. Both as major economies in the world and important regional countries, China and Japan should assume joint responsibility to play a constructive role in safeguarding global and regional peace and stability, as well as development and prosperity, he said. This year marks the 40th anniversary of the signing of the China-Japan Treaty of Peace and Friendship. Prime Minister Abe and the Japanese government have recently made a positive gesture toward the ties with China, said the Chinese president. With efforts from both sides, the China-Japan relations have entered the right track and are facing an important opportunity for improvement, Xi said, calling on the two countries to meet each other halfway, maintain good momentum, steadily carry forward bilateral ties and achieve greater development under new circumstances. China and Japan should always adhere to the four political documents signed by the two sides, consolidate political foundation, follow the right direction, and manage and control their differences in a constructive way, Xi said. The Japanese side in particular needs to properly address sensitive issues such as issues relating to history and Taiwan, actively create a good atmosphere and continue to expand common interests, he added. China welcomes Japan's active participation in its reform and opening up process in order to realize common development and prosperity, Xi told Abe. The Belt and Road Initiative has provided a new platform and experimental field for China and Japan to deepen their mutually beneficial cooperation, Xi said, adding that China is willing to work with Japan to focus on the new circumstances, explore new paths and create new highlights for the two countries' practical cooperation. China and Japan should jointly push forward regional integration and build a peaceful, stable and prosperous Asia, Xi said. The two sides also need to steadfastly safeguard multilateralism, the free trade system and the rules of the World Trade Organization, and promote the building of an open global economy, he said. On bilateral ties, the Chinese president called on both sides to carry forward the friendly tradition between the two peoples, further enrich it in the new era, and cement the social and public opinion foundation for China-Japan ties. For his part, Abe appreciated Xi for his sympathy for Japan's losses caused by the natural disasters. Japan has been committed to participating in China's reform and opening up process, while China's development has also exerted a positive and important influence on Japan, said Abe. Noting that the Japan-China relations are returning to the right track, with increasing space for bilateral cooperation, Abe said Japan hopes to establish a closer relationship with China so as to achieve common development and prosperity. Japan is willing to make positive efforts to boost high-level exchanges with China, strive for more fruits in cooperation and fast-forward the improvement of the Japan-China ties, Abe said. To that end, Japan will work to promote friendship between the two peoples and properly handle sensitive issues, he said, adding that on history and Taiwan issues, Japan has not changed its stance confirmed in bilateral political documents. 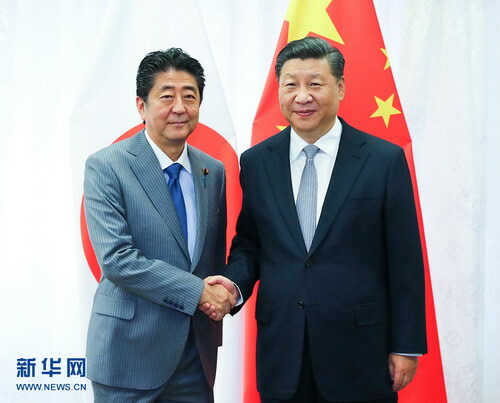 Japan attaches great importance to China's important role in international and regional affairs, and would like to enhance communication and coordination with the Chinese side on major issues concerning regional peace and stability, Abe said.